What else has been going on? Well, I've been back on a soda kick for some reason.... ok, it's because of the caffiene. Energy drinks have too much crash, but a bit of soda can be just enough to lift the fog for a little bit. To my great surprise, I really enjoyed Cherry Dr. Pepper. So much so that I've been searching for it since trying it (I finally found it at Wegman's this weekend but was unwilling to pay extra for it). 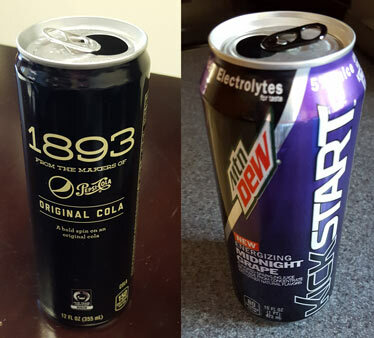 I also tried Pepsi 1893 this morning and I can't say I would recommend it. There's almost a slight burn to it, like you might get with a fireball. Lastly I finally tried that new Midnight Grape kickstart from Mtn Dew and I have a question: Ummm, didn't these things use to have coconut water in them? Marvo tried it first and I thought he mentioned it tasting like grape soda, which is does, but it's got that weird Sucralose funk to it that I really hate. So I'm all done with kickstart at this point. I've been eyeing the grape for several weeks but now that I've given in, I think I am fine being done with kickstart. Down with Sucralose! What else.... Well, I bought a bag of those unwrapped mini Reese's peanut butter cups. I couldn't remember if I had tried them or just the Butterfinger version, but I won't be buying them again. There is a weirdness to the texture, they are too soft (almost liquidy). I wouldn't throw them out, but it's not that magical texture we get with their larger products (should have grabbed a on sale bag of post-Easter Reese eggs). 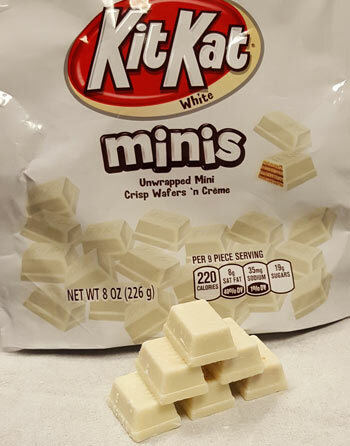 Lastly, I finally grabbed a bag of unwrapped White Kit Kat bars and man did they grow on me. I liked them at first and it got better from there. The size & flavor & texture all line up well and I totally recommend grabbing a bag. I'm sure I will be getting them again. That's it for now, have a good week everyone! Since you mentioned DQ, I noticed that the Thursday sundaes are now $1.49 rather than 0.99 in parts of MA...I shouldn't be surprised but I am disappointed! With respect to the fiber one ice cream, when indulging in ice cream, I just can't see being concerned about my fiber intake!